Apr. 20, 2019: North Stone Clean-up Day organized by District of Columbia Association of Land Surveyors. Apr. 10, 2018: WTOP's "The quest to save DC's 1st federal monuments." Oct. 14, 2017: Fifth annual boundary stone ride (see cue sheet). Sept. 23, 2017: East corner rededication: brochure, remarks by Stephen Powers, photos (1, 2, 3, 4), video, media. Ellicott, a prominent professional surveyor, hired Benjamin Banneker, an astronomer and surveyor from Maryland, to make the astronomical observations and calculations necessary to establish the south corner of the square at Jones Point in Alexandria. According to legend, "Banneker fixed the position of the first stone by lying on his back to find the exact starting point for the survey ... and plotting six stars as they crossed his spot at a particular time of night." From there, Ellicott's team embarked on a forty-mile journey, surveying ten-mile lines first along the southwest line, then along The northwest line, next along the northeast line, and finally along the southeast line. The team completed this rough survey in April 1791. Ellicott's team, minus Banneker, who left after the placement of the south stone, then began the formal survey by clearing twenty feet of land on both sides of each boundary line and placing other stones, made of Aquia Creek sandstone, at one-mile intervals. On each stone, the side facing the District of Columbia displayed the inscription "Jurisdiction of the United States" and a mile number. The opposite side said either "Virginia" or "Maryland," as appropriate. The third and fourth sides displayed the year in which the stone was placed (1791 for the 14 Virginia stones and 1792 for the 26 Maryland stones) and the magnetic compass variance at that place. Stones along the northwest Maryland boundary also displayed the number of miles they fell from NW4, the first stone placed in Maryland. Stones placed at intervals of more than a mile included that extra distance measured in poles. The boundary stones are the oldest federal monuments. Although several stones have been moved or severely damaged, thirty-six stones from the 1790s are in or near their original locations, including all fourteen in the land that was returned to Virginia in the 1846-1847 retrocession. Three other locations have substitute stones (SW2, SE4, and SE8), and one location (NE1) is marked only by a plaque. This site describes the locations of the stones as of 2016, updating the information provided by the Daughters of the American Revolution (1976) and the National Register of Historic Places (1996). Click the map markers below for photos and information about each stone. The D.C. Geographic Information System's 2011 survey provided precise GPS data for all but two stones that were respositioned after the survey and therefore have only approximate coordinates. Locations marked with "X" lack stones from the 1790s. A printable list of the locations appears at the bottom of the page. Save the map in Google Maps. After Ellicott's team, the next to survey the stones was Marcus Baker, who visited each stone's location during the summer of 1894. Baker reported his survey to the Columbia Historical Society. Following Baker, Fred E. Woodward photographed thirty-nine of the boundary stones--all but SW2, which had been lost even before Baker's survey--starting in 1905. In his reports to the Columbia Historical Society (published in 1907, 1908, and 1915) and in public presentations, Woodward described the extent to which the stones had deteriorated and proposed that they be protected for the enjoyment of future generations. Ernest A. Shuster, Jr., followed in Woodward's footsteps soon after with his own impressive photo collection and article. In 1915, the Washington, D.C., chapter of the Daughters of the American Revolution (DAR), citing Woodward's work, voluntarily assumed the responsibility of protecting the stones by erecting a tall iron fence around each one. For decades afterward, DAR members visited the stones periodically to perform routine maintenance. Despite DAR's care and attention, however, many of the stones fell on hard times during the mid-1900s. Several were repositioned, removed, lost, or buried during construction projects. "It was a fun project which we did over three or four days, All the Virginia ones one day, All Anacostia another. And I am pretty sure we did the top half of the city over two days. The green paint came from the DC parks department; my dad called them and set it up. An older parks employee came by the house one day with the paint and he and I drove around the city, to show me where the stones were. He seemed to be pretty enthusiastic about it, he showed me Southeast 9 and the one in Kenilworth Gardens. I am pretty sure he even took me across the bridge to the one at the southern tip of DC, but not the VA ones. So we sort of had permission to do the ones in DC. In VA we hadn't contacted anybody. If the stone was in a public place or a park, VA fences got a coat of green DC paint too. In some cases the stones, in VA, DC and MD were on lawns and cared for and we didn't do anything. We always rang the doorbells and talked to the people and asked if they wanted us to paint the fences. I think they always or almost always said no. Usually they had them painted black. Sometimes we clipped the weeds ad the hedges on private property, I think we did this for one on Eastern Avenue inside of a chan link fence surrounded by hedges. The only stone we didn't actually get to see was one in a backyard in VA, the first or second on the northern stretch. The woman of the house was very firm about not allowing us to see it." In 1990 and 1991, a resurveying team led by David Doyle to celebrate the District's bicentennial located two missing stones. In September 1995, the Northern Virginia Boundary Stones Committee (NOVABOSTCO), under the leadership of chairman Ric Terman, issued a 77-page report on the status of the fourteen stones in Virginia. NOVABOSTCO's successor, the Nation's Capital Boundary Stones Committee (NACABOSTCO), chaired first by Terman and later by Stephen Powers, has worked since 2000 to ensure the preservation and appreciation of all of the stones, partnering with DAR, the American Society of Civil Engineers - National Capital Section (ASCE-NCS), the District of Columbia Association of Land Surveyers, and other government agencies, historical societies, and professional associations. Boundarystones.org was created in April 2006. Since 2010, ASCE-NCS has led biannual restoration projects that pick up where Troop 98 left off. In 2014 and 2015, DAR renewed its efforts to preserve the stones. In 2015 and 2016, the District Department of Transportation and National Park Service worked together to protect the east and north corner stones and place replica stones for SE4 and SE8. For the first time since since the 1970s, all stone locations have visible markers. A. Morton Thomas and Associates, Inc.: The Hunt for Southeast 8 (Apr. 29, 1991). Alexander, Mrs. Sally Kennedy: "A Sketch of the Life of Major Andrew Ellicott," Records of the Columbia Historical Society, Vol. 2, pp. 170-182 (1899). Baker, Marcus: "The Boundary Monuments of the District of Columbia," Records of the Columbia Historical Society, Vol. 1, pp. 215-224 (1897). Chase, Louise Coflin: Boundary Stones of the District of Columbia (1930) [unpublished manuscript in the Washingtoniana Collection of the District of Columbia Public Library], later reprinted (minus one paragraph) in Records and History of the Boundary Stones of the District of Columbia (no date) [unpublished manuscript in the Kiplinger Research Library of the Historical Society of Washington, D.C.]. D.C. D.A.R. : Records and History of the Boundary Stones of the District of Columbia (no date) [unpublished manuscript in the Kiplinger Research Library of the Historical Society of Washington, D.C.]. Harris, Gayle T.: Biographies of the Boundary Stones (2001) [unpublished manuscript in the Kiplinger Research Library of the Historical Society of Washington, D.C.]. Miller, Mrs. Charles S., State Historian, D.C. D.A.R. : Correspondence with National Park Service regarding the disappearance and replacement of SE8 (1962). National Capital Planning Commission: Boundary Markers of the Nation's Capital: A Proposal for Their Preservation & Protection (Summer 1976). National Park Service: National Register of Historic Places Inventory - Nomination Form: Jones Point Lighthouse and District of Columbia South Cornerstone (Mar. 1980). Northern Virginia Boundary Stones Committee: 1994-1995 Findings and Recommendations of the Northern Virginia Boundary Stones Committee (Sep. 1995). Nye, Edwin Darby: "Revisiting Washington's Forty Boundary Stones, 1972," Records of the Columbia Historical Society, Vol. 48, pp. 740-751 (1973). Robinson, June: "The Arlington Boundary Stones," The Arlington Historical Magazine, Vol. 9, pp. 5-19 (Oct. 1989). Shuster, Ernest A.: The Original Boundary Stones of the District of Columbia (1908). Shuster, Ernest A.: "The Original Boundary Stones of the District of Columbia," National Geographic, pp. 356-359 (Apr. 1909). Stewart, John: "Early Maps and Surveyors of the City of Washington, D. C.," Records of the Columbia Historical Society, Vol. 2, pp. 48-61 (1895). Woodward, Fred E.: Chart Showing The Original Boundary Milestones of The District of Columbia (1906). Woodward, Fred E.: "A Ramble Along the Boundary Stones of the District of Columbia With a Camera," Records of the Columbia Historical Society, Vol. 10, pp. 63-87 (1907). Woodward, Fred E.: "With A Camera Over the Old District Boundary Lines," Records of the Columbia Historical Society, Vol. 11, pp. 1-15 (1908). Woodward, Fred E.: "The Recovery of the Southern Corner Stone of the District," Records of the Columbia Historical Society, Vol. 18, pp. 16-24 (1915). Woodward, Fred E.: "Boundary Mile Stones" (1916) in Records and History of the Boundary Stones of the District of Columbia (no date) [unpublished manuscript in the Kiplinger Research Library of the Historical Society of Washington, D.C.]. American Society of Civil Engineers: Letter to Senator Charles M. Mathias supporting legislation to protect boundary stones (Sep. 15, 1979). Caemmerer, H. Paul: "Washington The National Capital," Senate Document No. 332 (1932). Congressional Record: "A Bill to Preserve, Protect, and Maintain the Original Boundary Stones of the Nation's Capital" (Nov. 26, 1979). Council of the District of Columbia: "Federal Legislation on the Original Boundary Stones in the District of Columbia Support Resolution of 1984" (June 26, 1984). Ellicott, Andrew: Territory of Columbia (1793). Falls Church Historical Commission: "Federal Territory Boundary Stone No. Southwest 9" (July 1999). Federal Writers' Project: Washington City and Capital, p.770 (1937). National Capital Planning Commission: "Boundary Markers of the Nation's Capital," National Capital Planning Commission Quarterly, pp. 1-4 (Fall 1976). National Park Service: Letter to Nation's Capital Boundary Stones Committee declining to protect stones (June 13, 2003). U.S. Department of the Interior: Letter to Committee on Interior and Insular Affairs opposing legislation (H.R. 2638 / S. 569) to protect boundary stones (Mar. 29, 1984). U.S. Senate: "A Bill to Preserve, Protect, and Maintain the Original Boundary Stones of the Nation's Capital," (Nov. 26, 1979). Abrams, Alan: "Preserving NE #2, Takoma's Oldest Monument," Historic Takoma Newsletter (Feb. 2003). Alexandria-Washington Lodge No. 22: "Ceremonies Of Re-Enacting The Laying Of The Corner-Stone Of The District Of Columbia" (Apr. 15, 1941). Bartlett, G. Hunter: "Andrew and Joseph Ellicott: The Plans of Washington City and the Village of Buffalo and Some of the Persons Connected," Buffalo Historical Society, Vol. 26. pp. 3-48 (1922). Bedini, Silvio, A.: "Benjamin Banneker And The Survey Of The District Of Columbia, 1791," Records of the Columbia Historical Society, Vol. 47, pp. 7-30 (1969). Bedini, Silvio A.: "The Survey of the Federal Territory," Washington History, Vol. 3, No. 1: pp. 76-95 (Spring/Summer 1991). Bedini, Silvio A.: "Conserving the Boundary Stones," Washington Post, p. A18 (June 20, 1998). Birth, Wm. W.: "Disappearing District Boundaries," Evening Star, p. 14, column 2 (Apr. 4, 1900). Claudy, Carl H.: Your Masonic Capital City, p. 25 (1950). Columbian Centinel: "New Federal City," Columbian Centinel (May 7, 1791). County of Arlington: Origins of Arlington (2003). Cowan, John P.: "Boundary 'Error'," Washington Post, p. 12 (Jan. 3, 1951). Cressey, Pamela: "DC Boundaries Preserved by DAR," City of Alexandria Virginia (Oct. 17, 1996). Crowe, Cherilyn: "Stone Age," American Spirit, pp. 10-11 (May/June 2011). Deane, James G.: "Some Forgotten Stones Mark D. C.'s First Outline," Evening Star (Jan. 2, 1950). E.M.A. : "Return Arlington County?," Washington Post, p. 6 (Feb. 10, 1936). Evening Star: "Exploring Rock Creek," Evening Star, p. 15, column 6 (Oct. 25, 1890). Evening Star: "The Rock Creek Park," Evening Star, p. 3, column 6 (Dec. 30, 1890). Evening Star: "District Bounds. The Results of the Original Research of Marcus Baker," Evening Star, p. 12 (Oct. 2, 1894). Evening Star: "Old Marker Found," Evening Star, pt. I, p. 5 (June 22, 1912). Evening Star: "Protecting the Boundary and Corner Stones of the District of Columbia," Evening Star, pt. 4, p. 5 (June 4, 1916). Fairlington Historic District: Original District of Columbia Boundary Marker is Next to Fairlington (2011). Fernandez, Manny: "Humble Monuments to Washington's Past," Washington Post, pp. B01, B04 (July 10, 2001). Gaynor, Michael: " This D.C. Monument is 'Virtually Impossible' to Reach," Washington Post (Oct. 11, 2018). Gifford, Bill: "On The Borderline," Washington City Paper (Mar. 28, 1993). Glassie, Ada Boyd: "Belt Line Highway Around Washington Should Follow Boundaries of 'Ten Miles Square. '," Washington Post, p. 6 (Oct. 9, 1929). 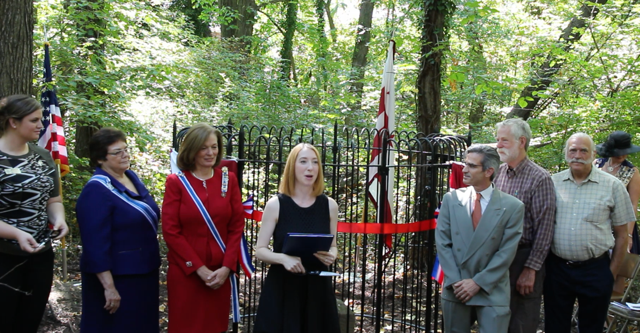 Hallett, Vicky: "D.C.'s Historic Boundary Stones are Being Preserved," Washington Post Express (Aug. 29, 2014). Hampshire Gazette: "Georgetown, March 12," Hampshire Gazette, p.3, column 2 (March 30, 1791). Hansard, Sara E.: "Old Stones Mark D.C. Boundaries," Washington Post, p. B1 (June 27, 1976). 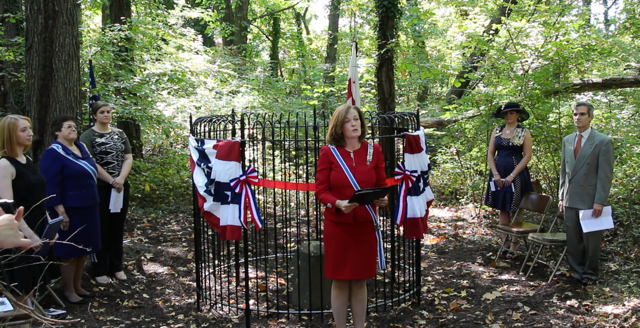 Harris, Hamil: "200-year-old Boundary Markers in D.C. Rededicated," Washington Post (May 8, 2015). Harris, Hamil: "Stones Laid by Benjamin Banneker in the 1790s are Still Standing," Washington Post (May 30, 2015). Howder's Site: Washington, DC Boundary Stones (Sep. 2000). Hume, Frank: "Centennial and Mount Vernon Avenue," Evening Star, p. 2, column 4 (Nov. 21, 1890). Johnson, T.: "City of Washington, July 11, 1795," Impartial Observer and Washington Advertiser (Aug. 14, 1795). Kanon, Matthew: Stoned Out of My Mind: A Guide to and Personal Reflections of the Boundary Stones for the District of Columbia (2003). Kaye, Ruth Lincoln: "The District's Boundary Stones," Washington Post, p. A18 (July 28, 2001). Kelly, John: "Arlington Man Watches Over Unsung Monuments to D.C.'s Origins," Washington Post, p. B3 (May 14, 2009). Kelly, John: "The Homeless and the Hungry Will Get a Boost from This Year's Helping Hand," Washington Post (Sept. 25, 2017). Kennedy, Barbara Noe: "Washington D.C.'s Coolest Treasure Hunt is Not What You'd Expect," Fodor's (Nov. 17, 2016). Lawrence, Kenneth: "Record of the Present Condition and Location of the Mile-Stones" (1949) in Records and History of the Boundary Stones of the District of Columbia (no date) [unpublished manuscript in the Kiplinger Research Library of the Historical Society of Washington, D.C.]. Manaugh, Geoff: "Boundary Stones and Capital Magic," BldgBlog (May 20, 2017). McCormick, Gene: "D.C.'s Southern Boundary Stone," Washington Post, p. A16 (July 15, 1998). Muller, John: "Boundary Stones: The Oldest Monuments in the District," Greater Greater Washington (October 25, 2011). Muller, John: "Without Preservation, DC's Boundary Stones Are in Danger," Greater Greater Washington (May 23, 2012). Muller, John: "Life And Times Of Boundary Stone, SE #6," East Of The River Magazine (July 2012). Nye, Edwin Darby: "Boundary Stones," Washington Star Sunday Magazine, pp. 6-9 (June 23, 1963). Pegoraro, Rob: "At Boundary Stones, Today's Virginia Meets Yesterday's D.C.," Washington Post Sunday Source, p. M8 (July 1, 2007). Powers, Stephen C.: "The Boundary Stones of the Federal City," ASCE Newsletter National Capital Section, Vol. 53, No. 7 (Mar. 2007). 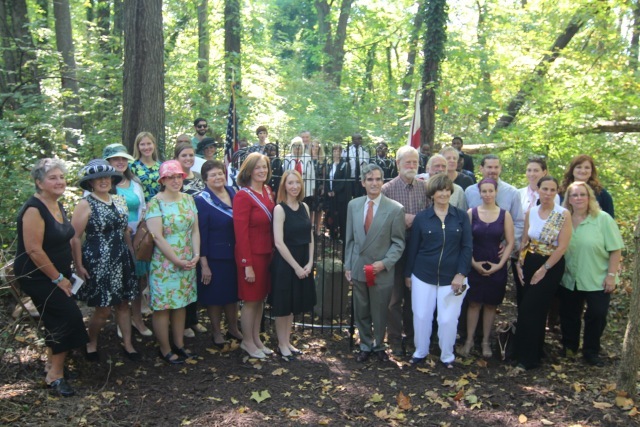 Powers, Stephen C.: "Washington DC Boundary Stones: History, Current Status, Preservation, and Fence Restoration Effort," ASCE Newsletter National Capital Section, Vol. 58, No. 8: pp. 1, 10 (May 2012). Powers, Stephen C.: "The Boundary Stones of the Federal City - Speaker: Stephen C. Powers, P.E.," ASCE Newsletter National Capital Section, Vol. 54, No. 3 (Nov. 2007). Proctor, John Clagett: "Boundary Stones," Sunday Star, pt. 4, p. F-2 (May 2, 1937). Redwood: "An Old-Time Relic," Daily Critic (Aug. 1, 1887). Rothstein, Ethan: "D.C. Boundary Stones a Silent Part of Arlington History," ARLNow (Sep. 19, 2013). Sadler, Christine: "D.C. Boundary Stones Historian's Nightmare," Washington Post, p. F2 (Dec. 10, 1939). Saul, Ana: "The Most Interesting Thing in Bradbury Heights," Washington Post, p. JP2 (Sep. 8, 1929). Sherwood, Tom: "History Unearthed: Boundary Stones of D.C.," NBC Washington (Jan. 28, 2015). Silverthorne, Alexandra: Ten Miles Square artwork and installation (2010). Socotra, Vic: The Northeast Stones (2003). Straumsheim, Carl: "On D.C. Border, History Hides Along Wayside," Northwest Current, Vol. XLIV, No. 43, p. 7 (Oct. 26, 2011). Sunday Star: "Boundary Stones of 'The Ten Miles Square'," Sunday Star, pt. 4, p. 7 (Feb. 11, 1912). Sunday Star: "Fence is Dedicated at Milestone No. 8," Sunday Star, pt. 1, p. 2 (Oct. 15, 1916). Todaro, Richard M.: "The Four Cornerstones of the Original D.C.," Washington Post (June 7, 1998). Twomey, Steve: "Lesser Known Monuments Map Out the Original D.C.; Team Marking Stones That Set Boundaries," Washington Post, p. B01 (Oct. 9, 1990). U.S. Geological Survey: "Federal District Boundary Markers in Northern Virginia: Condition and Preservation Issues" (1994). Van Mathews, Catherine Cortlandt: Andrew Ellicott: His Life and Letters (1908). Washington Herald: "The Boundary Stones. Marking the Lines of the Old District of Columbia and Virginia," Washington Herald, pt. 3, p. 7 (Mar. 3, 1907). Washington Herald: "Boundary Stone Unveiling," Washington Herald, p. 14, column 2 (Nov. 28, 1920). Washington Post: "Surveys of District," Washington Post, p. 32 (July 13, 1902). Washington Post: "District Not Plumb," Washington Post, p. E2 (May 27, 1906). Washington Post: "Old North Corner-stone Stands in Big Corn Field," Washington Post (Sep. 9, 1906). Washington Post: "Talk on Boundary Stones," Washington Post, p. 13 (Jan. 9, 1916). Washington Post: "To Dedicate Boundary Stone," Washington Post, p. 5 (May 29, 1916). Washington Post: "Dedicate Boundary Stone," Washington Post, p. R2 (June 4, 1916). Washington Post: "News of the Club World," Washington Post, p. ES14 (June 4, 1916). Washington Post: "Washington Unique in that it is the Only World Capital Founded by the Government Itself," p. 45 (Jan. 9, 1921). Washington Post: "D.A.R. Activities," Washington Post, p. 45 (Apr. 10, 1921). Washington Post: "Society Will Observe 'District' Day April 15," Washington Post, p. 2 (Feb. 19, 1922). Washington Post: "D.A.R. Records Deed for Historic Tract," Washington Post, p. 2 (July 1, 1926). Washington Post: "Gov. Welles, C.A.R.," Washington Post, p. S10 (Dec. 22, 1929). Washington Post: "Boundary Stones Washington Laid Here Still Stand," Washington Post, p. M15 (June 28, 1931). Washington Post: "Ancient District Boundary Marker Set by Washington," Washington Post, p. S7 (Dec. 27, 1931). Washington Post: "Boundary Stone Plaque Unveiled," Washington Post, p. C1 (Jan. 14, 1961). Washington Post: "Boundary Stone of DC Rededicated," Washington Post, p. A5 (June 6, 1965). Washington Smart Growth Alliance: "Regional Conservation Priorities," pp. 12-13 (2008). Washington Star Sunday Magazine: "The 37th STone," Washington Star Sunday Magazine, pp. 10-11(June 27, 1965). Washington Times: "Location of Original Cornerstone of the District," Washington Times (June 23, 1912). Washington Times: "'First Landmark,' Lost Half Century, is Found in Virginia," Washington Times, p. 7 (June 17, 1911). Washingtonian: "The Great Washington Bucket List," Washingtonian (Mar. 1, 2015). Wheeler, Richard S.: The Boundary Stones (Apr. 1963) [unpublished manuscript in the D.A.R. D.C. History collection]. Whitaker, Joseph D.: "Funds Sought to Preserve Original D.C. Boundary Markers," Washington Post, pp. B9-B10 (Mar. 6, 1983). Jones Point Lighthouse: in an opening in the seawall of the lighthouse at Jones Point Park on the Potomac River in Alexandria, Virginia. The lighthouse was built in 1855 and a seawall was constructed in 1861. As documented by Woodward and others, the stone was hidden behind this seawall until June 1912. Because the stone remains in an enclosure in the wall, it can be difficult to view it in its entirety. According to the Records of the Columbia Historical Society (Volume 2, pp. 60-61), on March 25, 1794, the district commissioners requested that the city surveyor "have a large stone lettered 'The beginning of the Territory of Columbia,' prepared and fixed at the beginning of the territory, in the presence of some of the gentlemen who were present at the fixing of the small stone now there." By June 21, 1794, this new corner stone had replaced the original ceremonial corner stone from 1791. According to Washington City and Capital, published in 1937, the original ceremonial stone was then buried beneath the fence around St. Mary's Catholic Cemetery, a short distance away. As Woodward noted in a reading before the Columbia Historical Society on March 18, 1913, "The stone is slightly varied in shape from the remaining ones, being about eleven inches by nearly fourteen inches, instead of the usual twelve by twelve." Additionally, as observed in a Washington Times article from June 23, 1912, "The inscriptions are almost illegible, only portions of the letters being visible, these being on the southwest side, the southeast side bears a part of the date, the figure '7' being discernible. ... The two remaining sides are unmarked and bear no evidence of ever having been inscribed." 1220 Wilkes Street: SE corner of the intersection of Wilkes and S. Payne Streets in Alexandria, Virginia. Around 1904, the stone was moved 225 feet from its original position. 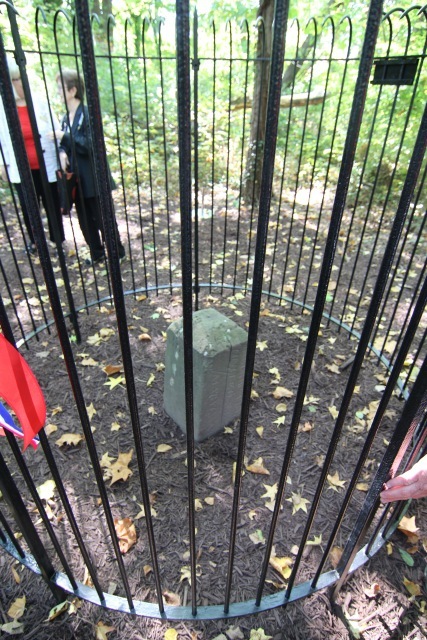 When it was reset in the ground, it was rotated such that the sides of the stone marked "Virginia" and "Jurisdiction of the United States" no longer face their respective jurisdictions. The letters on the District face of the stone are smaller than those of the other stones and in a different script. 7 Russell Road: east side of Russell Road just north of King Street. This is neither the original stone nor the original location. Baker and Woodward reported the original stone to be missing as of the late 1800s, and DAR records show that the current stone was placed at this location in 1920. The original stone was located about 0.35 northwest of this replacement. According to Woodward, the original "stone was evidently placed on the east side, and very close to, [King Street], on the eastern side of Shuter's Hill, in a subdivision" now called Rosemont. 2932 King Street: north end of parking lot of the First Baptist Church, south of Scroggins Road in Alexandria, Virginia. This stone has been removed from the ground and reset in concrete. Note that the address is not 2952 King Street, as some sources state. Adjacent to Fairlington Village at the edge of east side of King Street between S. Wakefield Street and Route 395. According to Woodward, farm plows had destroyed the top of this stone by the early 1900s. After being repositioned when the highway was widened, the remaining portion of the stone has sunk very low into the ground. North side of Walter Reed Parkway 100+ feet east of intersection with King Street. Only the stump of this stone remains. Its current condition is consistent with Woodward's 1908 report that the "stone is broken, and the top seems to be lost. The entire base, with a few inches of the finished portion, was found lying on the ground in approximately the same spot where it had originally been placed." This stone is now nearly 45 feet from its original position. Median strip of Jefferson Street 0.1 miles south of Columbia Pike in Arlington, Virginia. This stone has been repositioned several times. It also has been hit by a car and cemented back together. 5995 5th Road, Arlington, Virginia: Carlin Springs Elementary School, parking lot C, near the fence. It is also possible to reach this stone from the opposite directon via the private park behind the tennis courts at 3101 S. Manchester Street, Falls Church, Virginia. Follow the southeast edge of the tennis courts to the (often locked) gate to the private park. A short distance from the intersection of John Marshall Drive and Wilson Boulevard: 100 feet southeast of water tower behind the Patrick Henry Apartments. The stone is at the edge of the parking lot across from units 6184 and 6172. As the informational sign near the stone states, this is not the original location. Benjamin Banneker Park on Van Buren Street south of 18th Street in Falls Church, Virginia. Andrew Ellicott Park: 2824 N. Arizona Street (sometimes listed as 2824 Meridian Street), south of West Street in Falls Church, Virginia. 3607 Powhatan Street, north of 36th Street in Arlington, Virginia: west side of back yard, 200 feet from the road. 5298 Old Dominion Drive or 5145 N. 38th Street, Arlington, Virginia: in the fence separating the back yards of two homes. 4013 N. Tazewell Street, Arlington, Virginia: back yard of home. Within the fenced Dalecarlia Water Treatment Plant grounds, 100+ feet east of the Capitol Crescent Trail (from the "Entering Montgomery County" sign) and several hundred feet north of the intersection of Norton Street and Potomac Avenue. The easiest way to see this stone is through the fence along the Crescent Trail because the treatment plant is closed to the public. It is also possible to schedule a visit to the stone during normal business hours by calling the Dalecarlia Water Treatment Plant's main number at (202) 764-2753. Older sources list the stone's location as 5906 Dalecarlia Place. The "government dwelling" once located at that address has been demolished and the street formerly known as Dalecarlia Place has been converted to an access road. 150 northeast of intersection of Park and Western Avenues in small park, across from intersection of Western Avenue and Fessenden Street. 5600 Western Avenue: front yard of home near intersection with Cedar Parkway, McKinley Street, and 41st Street. The owners of the home removed the protective fence in the 1940s. In the mid-1960s, the stone was repositioned and a plaque was affixed directly to it. 6422 Western Avenue, southwest of Pinehurst Circle: front yard of home, within circular driveway. This stone does not have a protective fence. 2701 Daniel Road, Chevy Chase, Maryland: 165 feet northwest of the center line of Daniel Road and 5 feet southeast from the edge of the driveway. Near the intersection of Western and Oregon Avenues next to Rock Creek Park. Immediately south of East-West Highway in the edge of the forest just west of the townhouses at Chevy Chase Crest condominium community, near 1850 1806 East-West Highway. Please note that the marker in the traffic circle where 16th Street, Eastern Avenue, and Colesville Road intersect, more than a quarter of a mile to the east, is not a District of Columbia boundary stone. 6980 Maple Avenue, Takoma Park, Maryland: front yard of home near intersection of Maple and Carroll Avenues. 144 feet northwest of intersection of Eastern Avenue and Chillum Road at the edge of a commercial parking on the Maryland side of Eastern Avenue, just south of New Hampshire Avenue. 5400 Sargent Road: side yard of home on Maryland side of Eastern Avenue just north of Sargent Road. 4609 Eastern Avenue, northwest of Varnum Street: front yard of home. 3601 Eastern Avenue, near intersection with 34th Street: front yard of home. This stone has been reset in concrete. Fort Lincoln Cemetery: along the fence in Block 18, 75 feet southwest of Garden Mausoleum near Garden of the Crucifixion. Along the fence 500 feet northwest of the intersection of Eastern and Kenilworth Avenues. Until 2013, there were three trails that led to the stone. Because the area is now under development, these trails may not be as easy to follow as they once were. 1) From the intersection of Eastern and Kenilworth, follow the trail that begins at a separation in the fence along the north side of Kenilworth. The trail immediately winds to the right where it follows another fence northwest along the edge of a gravel distribution lot. The trail forks when the gravel lot fence begins to turn to the right; turn left here. The left fork roughly parallels another fence and leads to the charred rubble of a former dwelling. The stone is along the fence to the right, about 50 feet before you reach the remains of the dwelling. View route. 2) From the intersection of Eastern and Kenilworth, head southwest on Kenilworth and turn right on Quarles Road. Turn right again, before reaching 45th Street, onto a road leading to a smokestack across the street from an apartment complex. As Kanon explained in Stoned Out of My Mind: A Guide to and Personal Reflections of the Boundary Stones for the District of Columbia, "Just E of parking lot, look for a hole in the black fence. Follow a trail for about 300 ft. to another fence. Near a pool of water." 3) From the intersection of Eastern and Kenilworth, head southwest on Kenilworth and turn right on Quarles Road. Turn right again when Quarles ends at Anacostia Avenue. Anacostia ends shortly thereafter at a forest, where a trail leads past the former dwelling to the stone. 919 Eastern Avenue, 0.1 miles south of Sheriff Road: front yard of home. 100 feet southeast of intersection of Eastern Avenue and Southern Avenue. 30 feet south of intersection of D Street and Southern Avenue, near corner of wall around National Capitol Hebrew Cemetery. 4345 Southern Avenue, near intersection with Rail Street: front yard of home. Note that this is not 4245 Southern Avenue, as some sources state. Across the street from 3908 Southern Avenue, near Suitland Terrace. SE3 is unusually tall for an intermediate stone. Woodward, observing that the west corner stone is much shorter than the other corner stones, hypothesized that there was a mixup between the tall stone that became SE3 and the short stone that became the West stone. 3101 Southern Avenue SE: along the gate in front of the parking lot, just south of the merger with Naylor Road (and not at the intersection of Naylor Road and Suitland Parkway, as some earlier sources state). This stone is a replica created in 2015 and placed in early 2016 about twenty yards southwest of its original location. By the time of Woodward's visit more than a century ago, the original stone was "rounded, battered and chipped on every side" possibly because "soldiers used it as a target" during the Civil War. When a truck knocked the stone out of place in 1985, the manager of a nearby apartment building moved it into the building's boiler room for safekeeping. In 1991, the building manager gave the stone to the bicentennial resurveying team, who, in 2012, transferred the stone to the D.C. Office of the Surveyor, where it remains on display. 280 feet northeast of the northernmost intersection of Southern Avenue and Valley Terrace (the roads intersect twice within a quarter mile). This stone is next to the sidewalk along Southern Avenue in front of the Southern Avenue metro station. 901 Southern Avenue. Until early 2008, this was one of the best-looking stones. Then an out-of-control car broke the stone in half at ground level and destroyed the protective fence. During 2012 through 2014, the above-ground portion of the stone was stored in the D.C. Office of the Surveyor for safekeeping. The stone and a protective fence are again in place. 25 feet south of intersection of Southern Avenue and Indian Head Road on the east side of Indian Head Highway. This stone has been repositioned. Note that the National Register of Historic Places incorrectly states that the stone is northeast of the intersection. Behind Blue Plains Impoundment Lot: southeast corner of the lot on the Maryland side of the fence, a short distance from the lightposts. This is a replica stone created in 2015 and placed in early 2016. The most direct way to reach the location is to take Oxon Hill Farm Trail south from D.C. Village and then, after crossing the border into Maryland, follow the access road along the chain link fence west until you reach the back of the impoundment lot. The direct walking route will almost certainly take you through some very swampy territory, however. A cleaner and easier route is to take the Oxon Hill Farm Trail south from D.C. Village, and then, before crossing the bridge over Oxon Creek, follow the unpaved path to the right southwest along the creek to the large clearing with overhead power lines. Follow the clearing northwest to the fence along the Maryland border and then walk a short distance southwest along the fence to the corner of the impoundment lot. The original stone was removed in 1958 during construction and then either lost or stolen from a storage facility before it could be reset in the ground. On March 23, 1962, DAR placed a new inscription-less stone in the same location along with the original stone's iron fence. By 1972, this stone too was in trouble, as described by Edwin Darby Nye in a paper read that year before the Columbia Historical Society: "SE8, at the far end of the D.C. Village Area, has become a victim of a large land-fill operation, involving the D.C. auto impounding area, the new sewage treatment plant, and an eighteen-hole golf course being constructed by the National Park Service. SE8 is covered with some eight feet of landfill. A sixty-inch concrete pipe has been placed over the stone, iron fencing and all, and a cover placed over it to protect it. The stone has been uncovered and after excavation has been completed it will be reset in a proper location." Unfortunately, nothing of the sort occurred, and the substitute stone was completely covered by landfill until 1991 when the bicentennial resurveying team dug it out of the ground, using old photos to approximate its location. The team then decided that the best way to preserve the stone was to put it back underground, this time protected by a taller pipe that was visible above the surface. The substitute stone was removed in 2015 and replaced the next year with a replica of the original, now at ground level.